1. Keynote Speakers Enrique Penalosa, former mayor of Bogota, Colombia and Devlynn Chen, 17 year old Recycle-A-Bicycle intern speaking together. 2. Rude Mechanical Orchestra marching band procession leading 200 attendees with colorful signs down 6th Ave in Manhattan to workshop sessions. 3. Group workshops with people engaging in conversation. Recycle-A-Bicycle’s Youth Bike Summit is a three-day national conference geared toward youth, bikes education, and advocacy. Whether you’re a student, educator, or advocate, there is much to be learned though this dynamic, inter-generational exchange. This national conference offers a youth and adult Keynote presentation, 15 engaging workshops, hands-on activities, a thought-provoking visioning session with youth and adults working in communities near and far. By creating a space where ideas from bicyclists of all ages can be heard, we seek to create a more inclusive national dialogue that addresses the issues, rights, and concerns of all bicyclists.Learn more about the Youth Bike Summit in this video by Streetfilms. HISTORY: In March 2010, Recycle-A-Bicycle (RAB) attended the League of American Bicyclists’ National Bike Summit with two high school interns who had completed a comprehensive job training program and Earn-A-Bike program at RAB. Both participants learned they loved bicycles and expressed an interest in learning more about how bicycling fits into policy, the environment, social entrepreneurship, and community-building. Traveling to Washington DC for the first time, the 17 year old participants explored the nation’s capital by bike, attended the conference, and lobbied elected officials. As we debriefed on the bus ride home, we discussed the importance of engaging youth in the national dialogue of cycling education and advocacy. 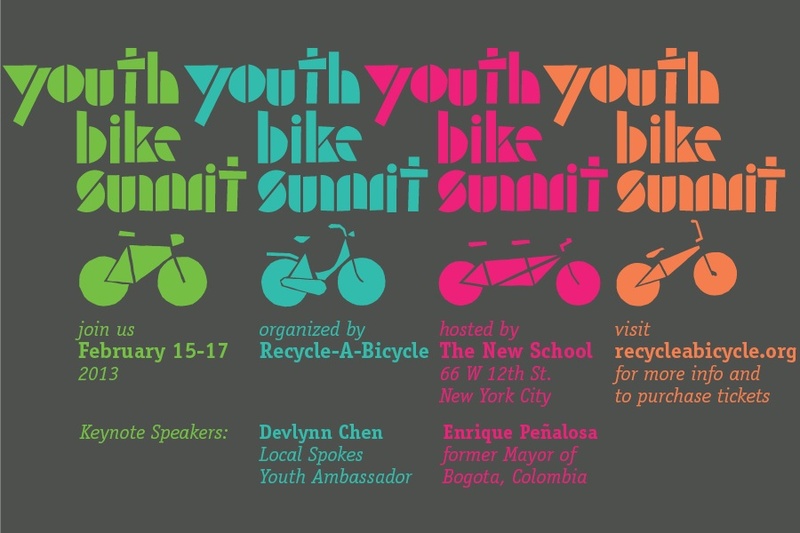 As a result, the idea of the Youth Bike Summit came into being. Both young advocates were active participants in the planning of the conference in 2011. 6:30pm – 9:00pm – Pizza Party! 2013 SPONSORS: Planet Bike, Bike New York, Specialized, SRAM, Cycling Sports Group, League of American Bicyclists,Transportation Alternatives, New York Cycle Club, Cascade Bicycle Club, Bicycle Habitat, Rails to Trails Conservancy, Rolling Orange,Permanent Mission of the Netherlands, Hostelling International, and The New School. 2013 STEERING COMMITTEE: Bike Works in Seattle, Bikes Not Bombs in Boston, Neighborhood Bike Works in Philadelphia, Cycles for Change in St. Paul, West Town Bikes in Chicago, and Recycle-A-Bicycle in New York City.